Japan Forever; And For Us? I suppose this was not really a surprise given how the Japanese people seem to have simply accepted their fate, economically speaking, so the resounding re-election of Abe’s party removes any further sympathy from a people dooming themselves to this sustained, toxic course. The election itself was not all about the economy in immediate consideration as there were several other factors, but Japan’s place is drawn by its economic depression; a fact even Abe acknowledged in his victory. Japan’s economy has been sluggish under more than 15 years of deflation, which made Japan’s weight in the international community decline and made Japan’s diplomacy and security policy weak. We can pursue powerful diplomacy only after we obtain a strong economy. To that end, Krugman wins. This latest recession was laid to rest inside the cover of “austerity.” In the Japanese form, that meant blaming the sales tax and that minor attempt toward fiscal sanity. It seems as if the electorate has bought it yet again. The highlighted word is everything, as positive numbers do not make an economy strong or even reflect as much. 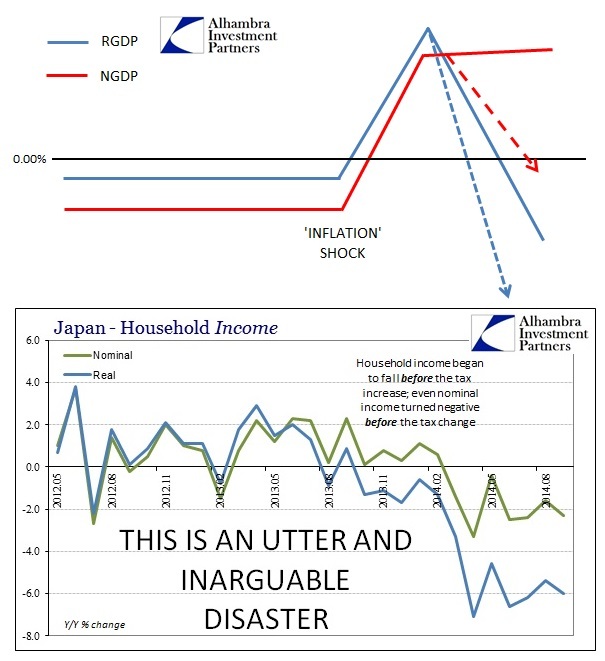 There is a vast difference between nominal and real, which is where the story of Japan’s latest collapse was written. This recession, which is getting even worse despite all of these confident projections consistent with austerity blaming, was clearly in place long before the tax change. 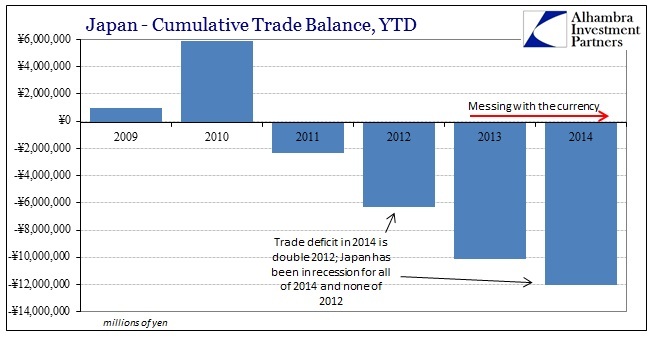 Abenomics was supposed to, in no uncertain terms remember, revive Japan’s now-ancient trade regime.  The renaissance of Japan Inc was not one of the central points of QQE, it was the primary focus. The Japanese people were delivered nominal growth in exports which amounted to exactly nothing in real terms. However, imports have been sustained at an advancing pace, amounting to a systemic and widespread impoverishment of all of Japan. 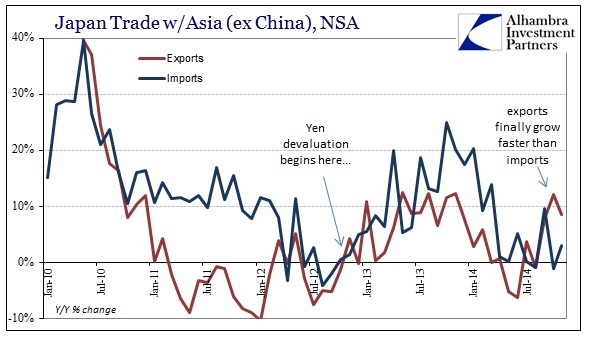 Nowhere is that more clear than in the divergence between what the Japanese show of exporting to the US in yen and what the US reports as imported from Japan in dollars. Where there was high correlation and agreement prior to the yen’s fall, there is nothing of the sort now. Japan might show rising exports, but that is now what is being received on the other end; meaning Japan’s revival is a simple figment of monetary imaginings. While this accounting and retribution remains vital if Japan will ever shake free from its statist-driven malaise and systemic poverty, there is still the matter of ongoing recession. 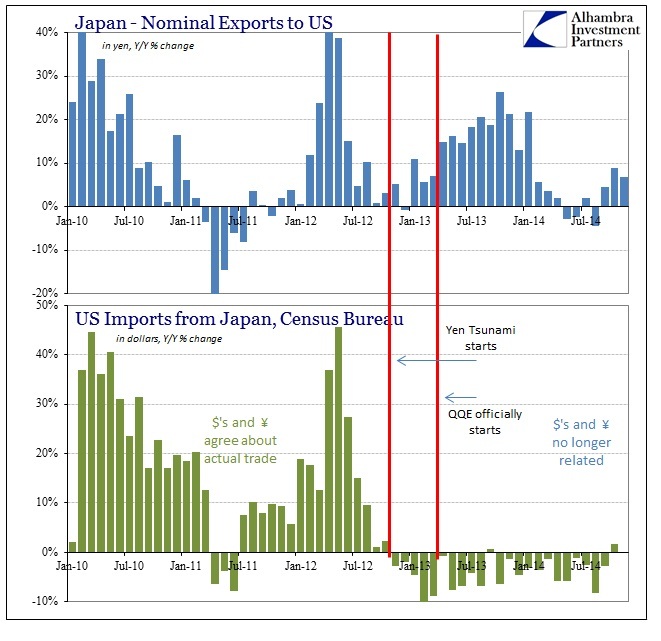 Indications are not positive about a quick turnaround (which, again, is why Abe called the election when he did, before it got even worse and the Keynesian dreams were electorally acknowledged otherwise), especially in trade. 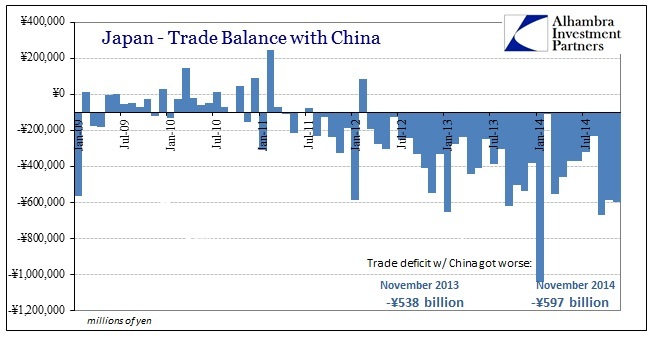 While imports overall were down Y/Y in November, they were so in the “wrong” places. 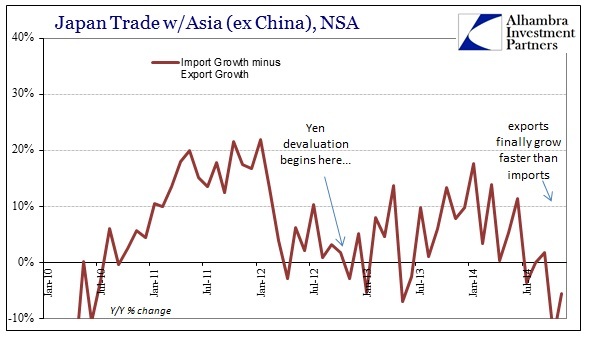 In other words, the decline in imports relates to Japan’s internal implosion rather than the reverse of its productive suicide. Imports from the rest of Asia are lower (signaling reduced energy from a much reduced economy), while remain on an upward slope from China. A true recovery would have these reversed. 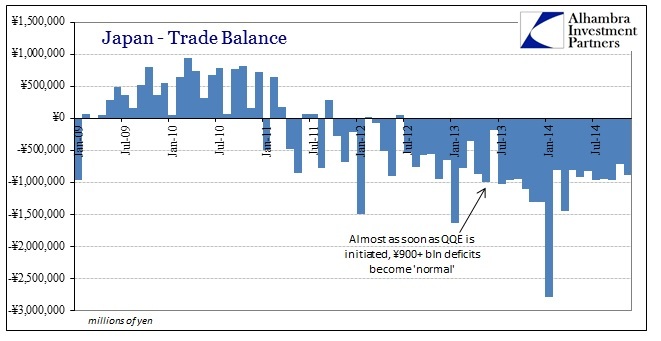 That reality is starting to work its way into even business sentiment, a dangerous proposition given the weakness inherent in what the trade data suggests. Big Japanese manufacturers grew less optimistic in October-December and foresee conditions worsening in the following quarter, a government survey showed on Wednesday, suggesting that the economy’s recovery from recession will be slow. “Abenomics is not having clear traction across the country and even though as an industry we benefit from the weaker yen, we feel a sense of crisis about the fact that cars are actually not selling,” he said. In other words, redistribution benefits only a very few, and thus “unexpectedly” doesn’t work? This is an utter and inarguable disaster of government-driven “stimulus” in all its forms. 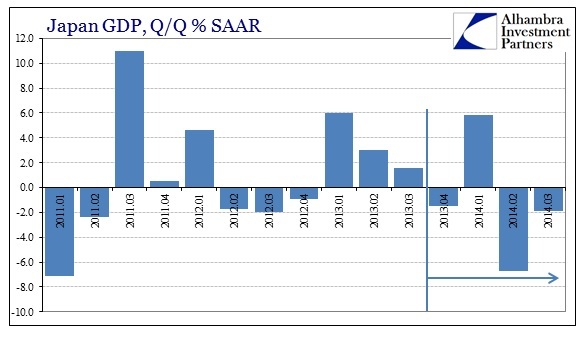 Not only has the Bank of Japan unleashed a starkly dangerous devaluation, we should not forget that it was paired with fiscal spending to “cushion” the tax blow. It didn’t work despite all Keynesian expectations, amounting to nothing more than total and pure rejection of the theory down to its very core, but the Keynesians are declaring victory – and the Japanese people, at this moment, agree. There is no more sympathy for people that refuse to help themselves, a course which I am afraid, given the Krugman revivalism now launched globally, has already spread far and wide. That is even worse than it sounds, as that is apparent now on the downswing at the chafing end of this cycle, suggesting not an aid to that descent but rather already stunting the next cycle before it ever begins. Redistribution ad nauseam, fatum in perpetuum.